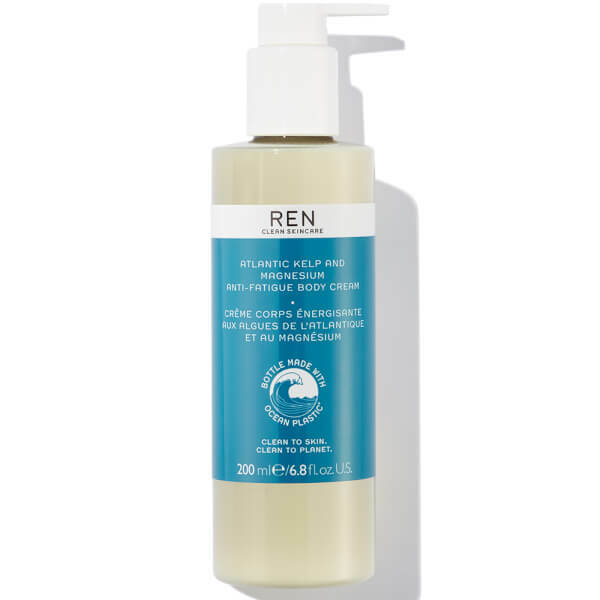 Instantly energise skin with the REN Skincare Atlantic Kelp and Magnesium Anti-Fatigue Body Cream; a rich moisturising lotion with a convenient pump applicator. The nourishing formula effortlessly glides over skin, absorbing quickly to envelop the body in a veil of moisture. Comfortably massaging the moisturiser over the body helps to relieve feelings of muscle fatigue and therefore offers a relaxing feel. Infused with Atlantic Kelp Extract, which is rich in Hyaluronic Acid, the body cream works to retain healthy moisture levels in skin, whilst leaving the body smooth and nourished. The hydrator also boasts a blend of Plankton Extract and Magnesium PCA, which seeks to energise the body by encouraging cell renewal and reducing stress damage. 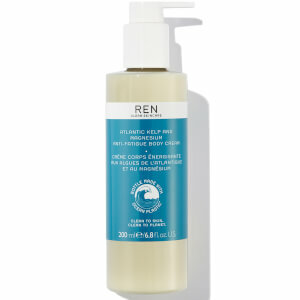 Finished with a signature dose of REN’s anti-fatigue essential oil blend, the cream not only indulges the skin, but has an uplifting effect on the senses too. After a shower or bath, apply over skin and massage with long strokes from legs upwards until fully absorbed. A small amount will go a long way. 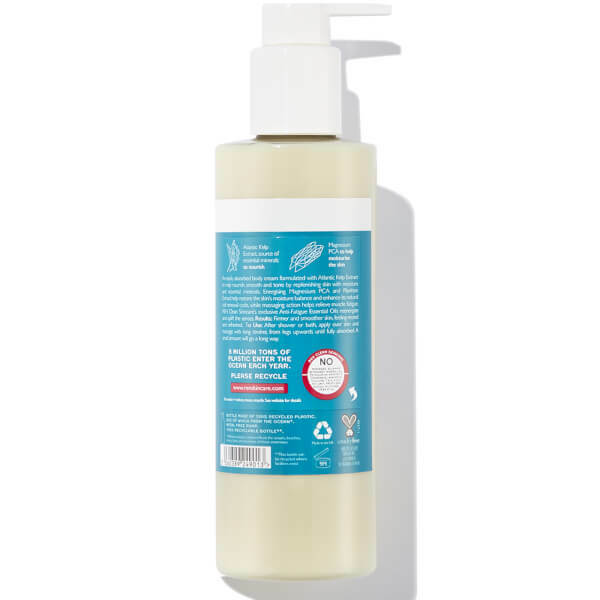 Aqua (Water), Glycerin, Isononyl Isononanoate, Lauryl Laurate, Oleyl Alcohol, Triheptanoin, Cetearyl Alcohol, Hydroxystearyl Alcohol, Arachidyl Alcohol, Olus Oil, Shea Butter Ethyl Esters, Helianthus Annuus (Sunflower) Seed Oil, Behenyl Alcohol, Hydroxyacetophenone, Carbomer, Arachidyl Glucoside, Hydroxystearyl Glucoside, Magnesium Pca, Xanthan Gum, Rosmarinus Officinalis (Rosemary) Leaf Oil, Inulin Lauryl Carbamate, Pelargonium Graveolens ­Geranium‑ Oil, Salvia Sclarea (Clary Sage) Extract, Tocopherol, Cupressus Sempervirens (Cypress) Leaf/Stem Extract, Chondrus Crispus, Plankton Extract, Parfum* (Fragrance), Laminaria Digitata Extract, Glucose, Gluconolactone, Phenoxyethanol, Sodium Benzoate, Sodium Levulinate, Sodium Hyaluronate, Potassium Sorbate, Citric Acid, Citral, Citronellol, Geraniol, Limonene, Linalool.